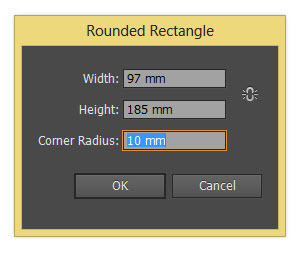 Draw a small circle (holding down shift) at the bottom of your large rectangle and use the Adobe Illustrator alignment panel (Window>Align) to centre both the large rounded rectangle and the circle together. Open the Adobe Illustrator Gradient panel (Window>Gradient) and set the stroke of the circle to the black to white gradient and 2mm, set the gradient angle to -90. 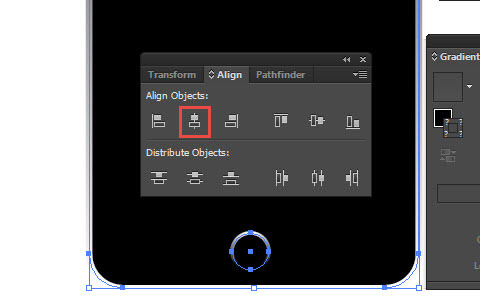 Choose the rectangle tool from the Adobe Illustrator toolbar, click and drag to draw a large rectangle for your screen. 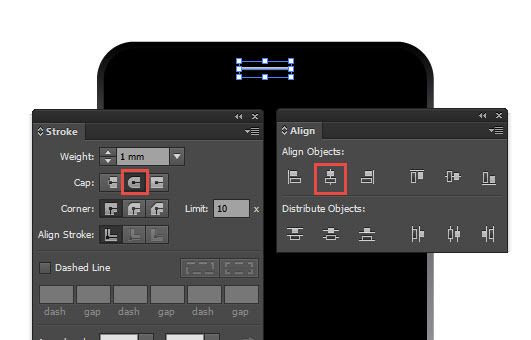 Use the illustrator alignment panel to centre it with the rest of the shapes. Coose nothing for the sroke colour and within the Illustrator swatches panel choose the gradient that fades from blue to transparent. Then use the Adobe Illustrator Gradient panel to set the gradient angle to 90. Next choose the Line tool from the Adobe Illustrator tool bar, draw a short line holding down the shift key for the ear piece. Then open the Illustrator Stroke panel (Window>stroke) and the Illustrator Alignment panel (Window>Align). 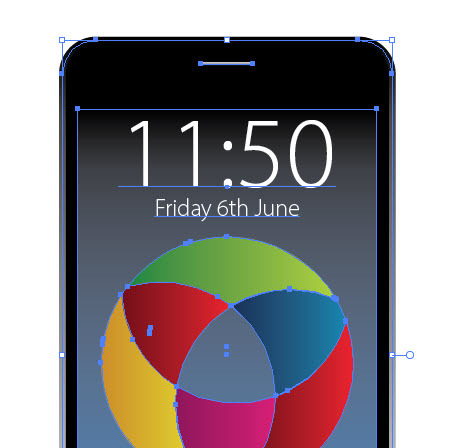 Choose the rounded stroke cap and align all the content to centre as previous. 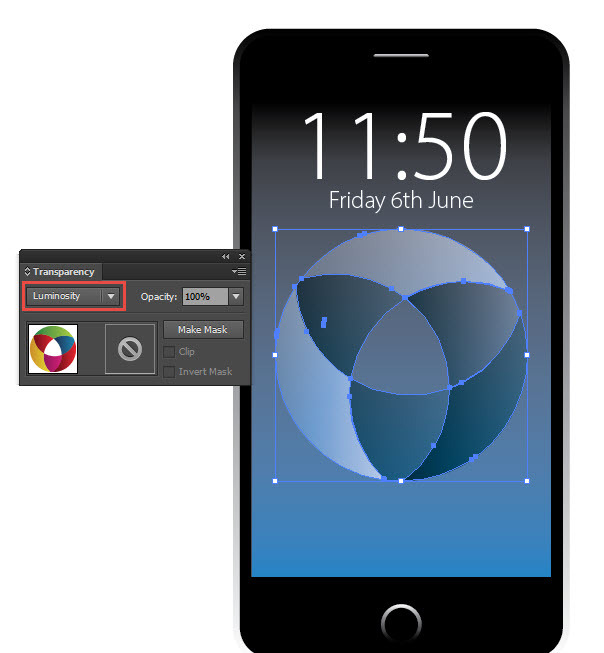 Open up the graphic that you would like to appear on the iPhone screen, then copy and paste it in to your document, use the Illustrator Alignment panel to centre everything once more. 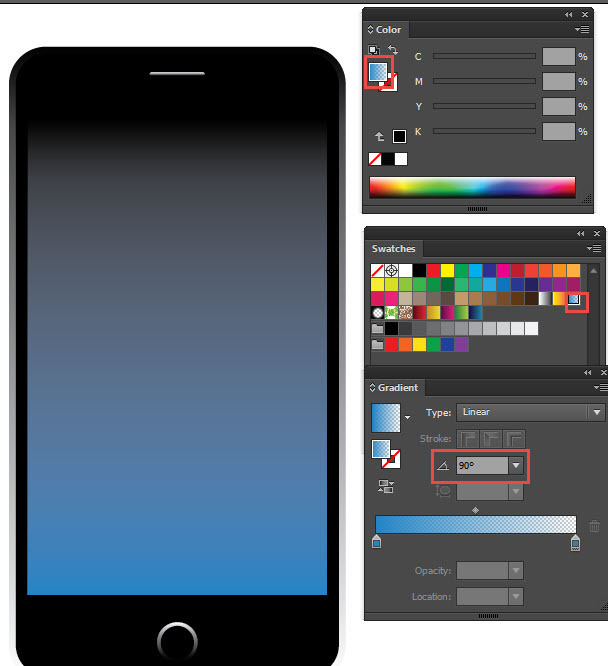 Choose the type tool from the Adobe Illustrator Tool bar, click on your phone and type the time and date on two lines. you can use the control bar at the top of the screen to adjust the type size and font. Now we are going to open the Adobe Illustrator Transparency panel (Window>Transparency) and select our logo graphic. Change the overlay to ‘Luminosity’ to help the logo become part of the screen. 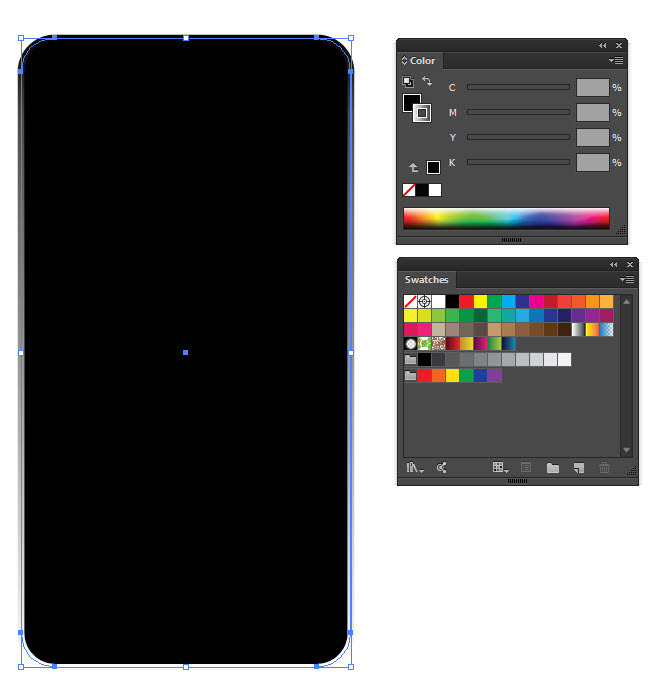 Now open the Adobe Illustrator Apearance Panel (Window>Appearance) select the large rectangle that makes up the body of the iPhone. 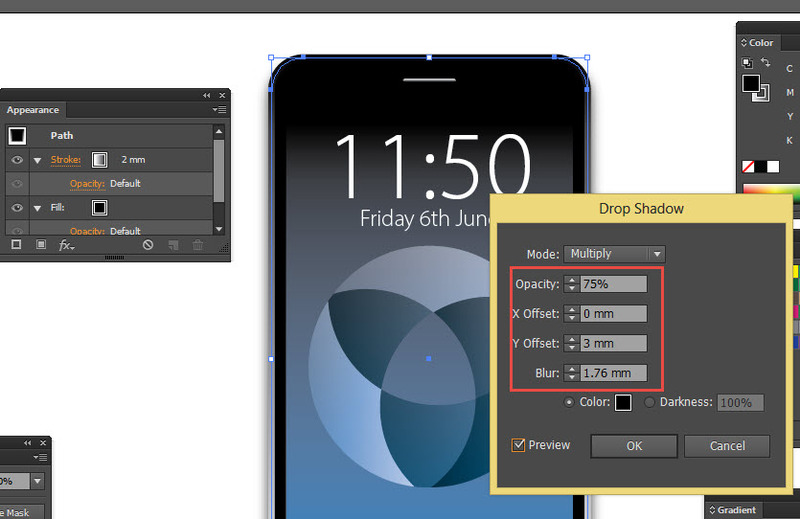 Click on the smal ‘Fx’ button at the botom of the Appearance panel, choose Stylise>Drop Shadow and fill in the values as the picture above. 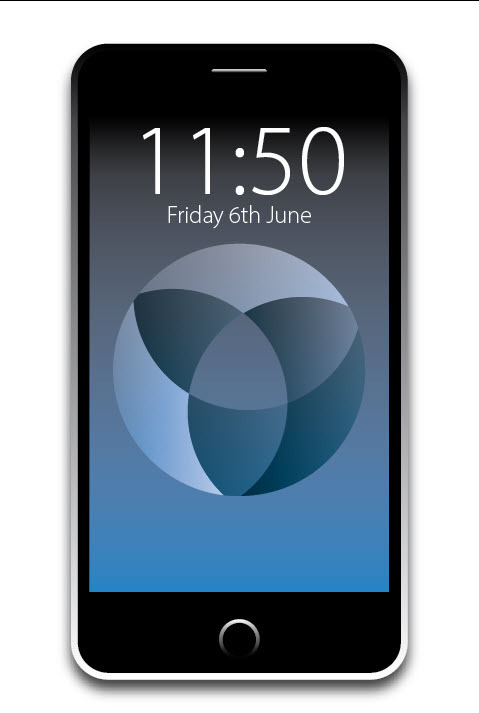 And here we have it a finished iPhone vector graphic that can be scaled as big or as small as you need for any application! 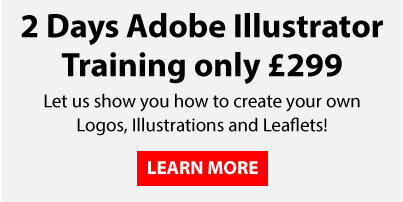 If you’d like to learn more about Adobe Illustrator, why not check out our Adobe Illustrator Training Course?